John Brett (1831–1902), Man of War Rocks, Coast of Dorset (detail) (1884), oil on canvas, 61 x 71.1 cm, Yale Center for British Art, New Haven, CT. Wikimedia Commons. In the last article, I showed some of the long run of Pre-Raphaelite landscapes painted by John Brett (1831–1902) prior to 1870. This article continues by looking at his paintings from 1871 onwards. Now Brett had the first of his yachts, he concentrated on painting the British coastline in a style which progressively departed from the Pre-Raphaelite. In the summer of 1870, Brett sailed around the south-west coast, making detailed notes, sketches, and studies as he went. The British Channel Seen from the Dorsetshire Cliffs (1871) is a large canvas which Brett apparently painted from those, during the later part of that year. Although not geographically-specific in any way, it is usually thought to have been painted from the cliffs above Lulworth Cove in Dorset. When it was exhibited at the Royal Academy, debate was focussed on whether the azure colour used for the sea was appropriate. John Brett (1831–1902), A North-West Gale off the Longships Lighthouse (1873), oil on canvas, 106.7 x 213.2 cm, Birmingham Museum and Art Gallery, Birmingham, England. Wikimedia Commons. A couple of years later, he painted another large maritime canvas of A North-West Gale off the Longships Lighthouse (1873) in which the lighthouse and rocks are the only clues as to its location. Again it was painted in his studio after notes and preparatory sketches. It was well-received when exhibited at the Royal Academy in 1873. 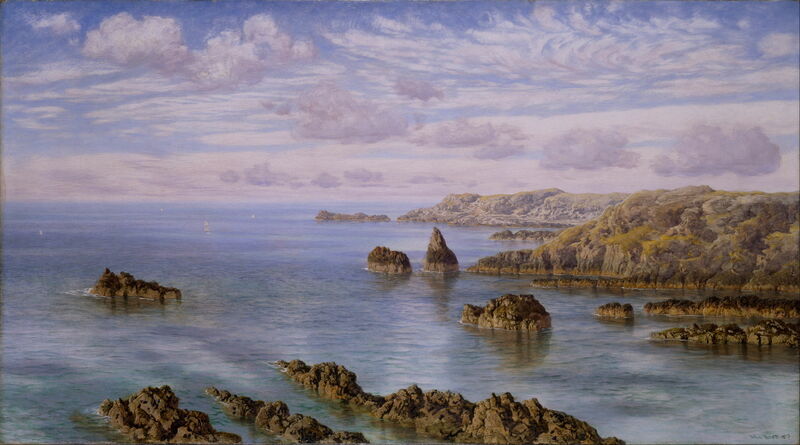 John Brett (1831–1902), Southern Coast of Guernsey (1875), oil on canvas, 61.2 x 108.2 cm, Birmingham Museum and Art Gallery, Birmingham, England. Wikimedia Commons. Southern Coast of Guernsey (1875) was the smaller of two substantial canvases painted following Brett’s cruise around the Channel Isles in the summer of 1874, and shows his returning interest in the coastline. Exhibited at the Royal Academy in 1875, Ruskin wrote a mixed comment, in which he criticised its loss of subtlety and size, but complimented Brett on the atmosphere of its extreme distance, and his “science” in alternations of colour. 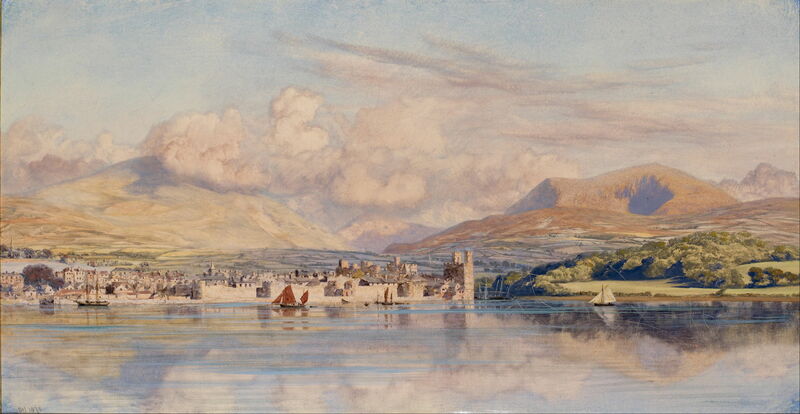 John Brett (1831–1902), Caernarvon (1875), oil on canvas, 24.1 x 47 cm, Birmingham Museum and Art Gallery, Birmingham, England. Wikimedia Commons. Brett’s superb view of Caernarvon (1875) does appear to have been completed in front of the motif, during his summer campaign around the Welsh coast that year, being significantly smaller and dated in October. It conforms more strongly to his earlier Pre-Raphaelite style, with intricate detail in the foreground waterfront, bright colours, and geological passages. He continued to paint some pure seascapes, such as the highly successful Britannia’s Realm (1880), although by now these were products of his Putney, London, studio and based on earlier notes and sketches. Exhibited at the Royal Academy in 1880, this was purchased ‘for the nation’ from the Chantry Bequest even before it had been seen by the public. Brett was then able to order an even larger yacht, and spent the summer painting the rugged coast of Cornwall in more Pre-Raphaelite style. He was elected an Associate of the Royal Academy the following year. John Brett (1831–1902), On the Welsh Coast (1882), oil on canvas, 17.8 x 35.6 cm, Yale Center for British Art, New Haven, CT. Wikimedia Commons. On the Welsh Coast (1882) is an example of one of his smaller oil sketches from this time: a fine painting, but by now quite divorced from the Pre-Raphaelite. John Brett (1831–1902), Man of War Rocks, Coast of Dorset (1884), oil on canvas, 61 x 71.1 cm, Yale Center for British Art, New Haven, CT. Wikimedia Commons. 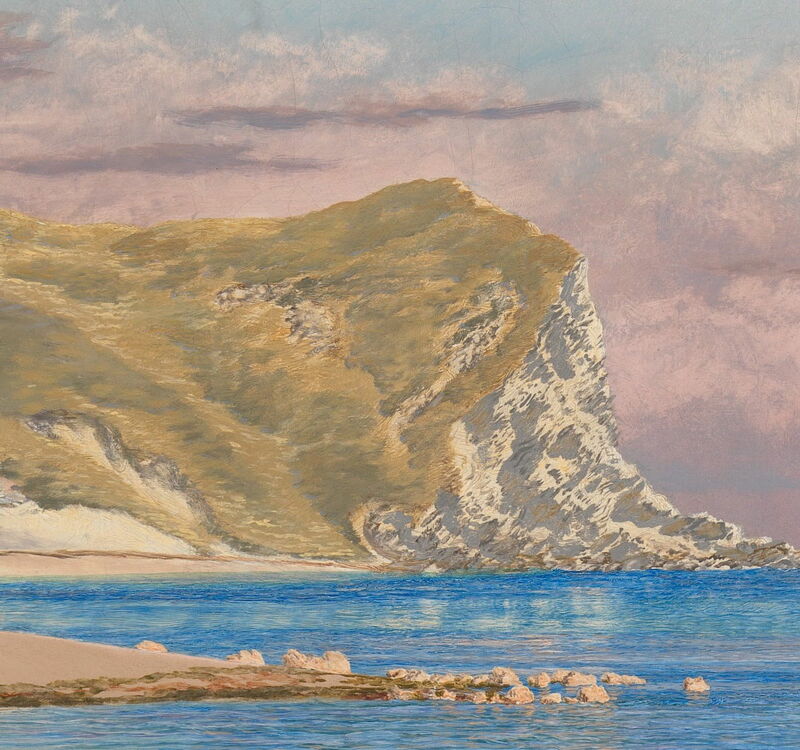 A few of his later paintings did, though, hark back to his works showing the Italian coast: Man of War Rocks, Coast of Dorset (1884) is smaller than his large commercial canvases, and once again shows the old Pre-Raphaelite characteristics of foreground detail, meticulous geology, and bright colours. It is not so clear, though, how much – if any – was painted in front of the motif. Much seems to have been based on notes and a watercolour sketch made back in 1870, before Brett had started producing his lucrative seascapes. 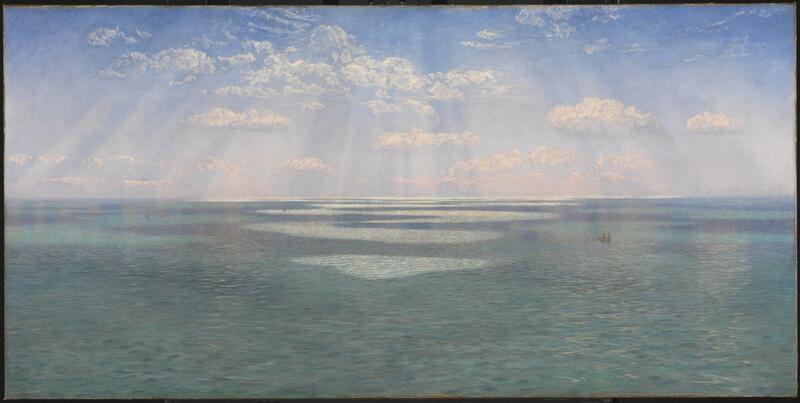 John Brett (1831–1902), Seascape (1887), oil on canvas, 38.1 x 76.2 cm, Yale Center for British Art, New Haven, CT. Wikimedia Commons. In his later years, Brett painted more coastal views, some of which were as good as before, but generally their quality declined with time. Like his Seascape (1887), they became more formulaic and less inspired, and were far from Pre-Raphaelite. However, Brett was probably the only artist to have built his reputation on Pre-Raphaelite landscape paintings, and may well have been the last of that rare breed of artist who continued painting pure landscapes in Pre-Raphaelite style. Newall C (2012) Review of Payne (2010), Burlington Mag. 154, July 2012, pp 498-499. Posted in General, Painting and tagged Brett, landscape, painting, plein air, Pre-Raphaelite, Ruskin, seascape. Bookmark the permalink.